In preparation for my posts on fear I have been doing some reflection on the path my life has taken and how different fears have motivated me. There are healthy fears, reasonable fears and unreasonable fears. I have been compelled to act by all three with varying measures of success and/or catastrophic results. One thing that has remained a constant, God's faithfulness. The college I used to work for had special chapel services once a semester. They were called "Stones of Remembrance." As I reflect on my time at the college, besides some people, those chapels are the thing I miss the most. The idea was that someone would select a stone to be added to a pile that was placed in a prominent place on campus. He or she would give testimony to a time in their life that God demonstrated His faithfulness in a unique way. Then their stone would be added to those of other students, faculty and staff who had also given their testimonies. The idea was based on Joshua 4:9ff and 1 Samuel 7:12. My family had one love that united several generations. I wish I could say it was the Lord, but it was gardening. My mother used to call me Luther Burbank because she said I could grow anything. The women in my family were superstitious and if ever you were given a plant, seed or cutting, you couldn't thank the person that gave it to you for fear that the plant wouldn't grow. I loved to tease my grandmother and step-mother (who was my aunt, my mother's full sister) by taking plants and thanking them for them. My grandmother would get so mad she'd take the plant away from me. It was good natured but serious. She wouldn't have her plants dying on account of my lack of superstition. 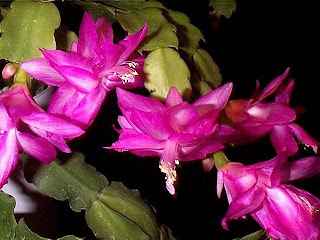 My great-grandmother had a beautiful Christmas cactus that had outrageous fuchsia-colored blooms. My grandmother admired it and eventually her mom gave her a cutting. Grandma's Christmas cactus grew into a gigantic plant that lived in an old galvanized tub on her front porch. It had to be 4 feet wide and 3 feet tall. My step-mom was given a cutting from the plant and started her own monstrous beauty. I always wanted to be given a piece of the cactus, but knew I had to wait my turn and prove myself. My grandmother died before I was offered my cutting and though he tried to do right by it, grandpa killed the plant with long periods of neglect followed by bouts of over-watering. One day while I was visiting my father and step-mom/aunt, she offered me a cutting that she had started. It was the Christmas cactus and I was thrilled. It solidified my adult status and it was the only heirloom I was likely to receive from my great-grandmother, grandmother and mom. I was living north of San Francisco in wine country, the very place that Luther Burbank had decided was best for his horticultural research. My plants and gardens were lush and thriving. I had my Christmas cactus under my covered front porch where it bloomed and made me the envy of my neighbors. And then it happened. One January in the late 80's or early 90's we experienced a cold spell that dropped our temperatures into the single digits. Living in Kentucky now, I watch the weather daily. In California, unless you depend on crops for a living, you just don't have to be diligent about the weather. Thinking my beloved plant was safe under the cover of the porch, I didn't bring it in the house until it started turning yellow. I was panicked. I brought the plant in and began emergency intervention. I fussed and worked on it and put it in the best spot in the house, which was in the middle of my dining room table, and then quickly sought divine intervention. This was before I had taken my girls into my home to raise. I was single, made way too much money, drove a sports car, traveled the world and had an apartment in the old part of town that could have been featured in House Beautiful. In the center of my new, solid oak table, in a pot that was way too expensive but beautiful, was my dying Christmas cactus. My friends, who were not Christians, made a great deal of fun of me. I told them they could laugh all they wanted. I was praying for the cactus and God was going to bring it back to life for me. I prayed, I fussed, I watered that cactus for months until one day when I went to take care of it, it literally disintegrated. Despite my gentle, loving care it crumbled into teeny little pieces and I crumbled right along with it. All hope for the plant gone, I was heartsick . . . and then anger took over. Crying and sobbing I snatched the pot up off the table and stomped into my kitchen with it. I threw the dirt in the garbage and started washing the pot, all the while yelling at God. "You knew how much that plant meant to me. You didn't have to kill it! I know I should have brought it in earlier, but you didn't have to teach me this way! You raised Lazarus from the dead, certainly a Christmas cactus was no big ticket! My friends are going to laugh at me and ridicule me." On and on I railed until I guess I came to my senses and said "You could have brought my plant back to life if You wanted to and You didn't. I guess I have to accept that and learn the lesson." I no sooner spoke those words than I heard a voice tell me, "Go outside." Now, I am not in the habit of hearing voices. That's something reserved for crazy people- so I did the only sensible thing and ignored it. "Go outside." I couldn't say that it was an audible voice that I heard. It was more like my own inner monologue but it wasn't me talking. I know that because my inner monologue was singing "la la la la I can't hear you, I am not even listening!" "Go outside." I couldn't take it any more and I went out and stood on the front porch and said "OK, what?! I am outside!" "Look down." I looked down and saw the big geraniums that had survived the cold. They were blooming and gorgeous. Because I am a jerk my response was, "Oh no! If You are trying to get me to be thankful for these geraniums, I am not going to do it. These cost me $2.98 and they didn't mean anything to me!" And then I heard, "Look down." So I took a sharp, annoyed breath, pursed my lips and looked down. Something compelled me to move the big leaves of the geranium to the side. There, in the soil where it had gone undetected and been sheltered by that geranium that meant nothing to me, a piece of my Christmas cactus had broken off, fallen to the soil and taken root. It was thriving there. I know that I gasped when I realized what I was seeing and then I heard, "Before you knew to ask me, I had taken care of this for you." I wish I could say from that day on I have never worried or complained about God's providence in my life. I still suffer disappointments and need to be reminded to take inventory. Until now I have only shared that story with a few people. Some of whom have taken cuttings from the plant. While I was working at the college, there was a picture of it in bloom on my bulletin board. When people would comment on the picture, I would tell them the story. It's a good story to have when you're a counselor. I had to part with the plant when I moved to Kentucky. I told the story to one of the couples I have adopted over the years as they were helping me move. I met them at the college before they were married and they remain dear to me now. Melinda heard the story and picked the plant up and said, "We'll take it." She also took a small piece of it, wrapped it in a moist paper towel, placed it in a zip lock bag and hid it in my car before I drove off. I found it a couple weeks later. Although my cat has tried hard to kill it, a very small piece of it remains and I have great hope of seeing it bloom once more. I love this story! Those 'everyday things' that God uses to teach us timeless lessons, are quite often the most memorable markers in our Christian walk.